← Adding The Yum to Yummy! I decided to create another dish to enter into the North Carolina Sweet Potatoes 2011 Sweet n’ Healthy Blogger Recipe Contest. Today is the deadline and you know me, wait ’til the last minute. mixed with other ingredients puree’d into a vinaigrette dressing. 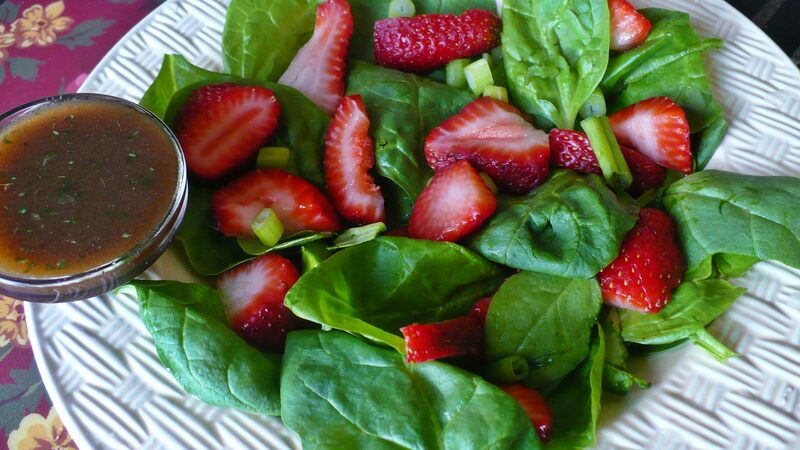 To be drizzled over a spinach and strawberry salad (pictured above). I entered this salad with it’s sweet and tangy dressing into the Sugar-Free Category. With the natural sweetness of the sweet potato and the molasses mixed with the tang of the balsamic vinegar, it’s a winner in my book. When it’s warmed, prior to serving, it adds more flavor to the rich spinach. The strawberries and almonds adds such a nice addition of texture. This is far from being a bland salad. Kick it up a notch and add a few sprigs of mint leaves or chopped cilantro. Enjoy! 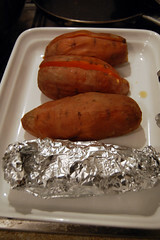 For more recipes using sweet potatoes, visit the North Carolina Sweet Potato Commission’s website. Slice open baked sweet potato and spoon into food processor. Add molasses, vinegar, lemon juice, parsley and pepper. Pulse to puree. While processor is on, slowly add olive oil into chute. Run for at least 5 seconds until all combined. Pour into a microwave-safe bowl or cup. If dressing is not liquid enough, add more olive oil and vinegar. Taste. If needed, add more molasses for sweetness. (Dressing should be sweet and tangy). Set aside. Divide spinach among 6 serving plates; top with strawberry and onion slices and almonds. Place bowl or cup of vinaigrette into microwave and heat for 1 minute to 1 1/2 minutes. 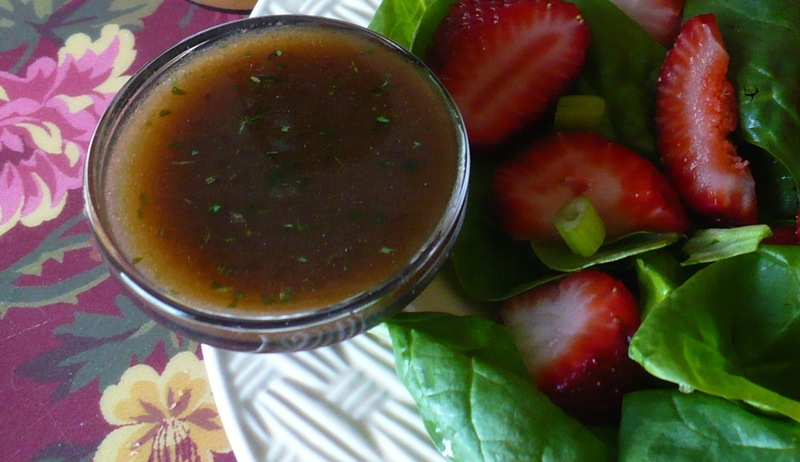 Drizzle with warm vinaigrette or pour vinaigrette into dressing cups to be served on side of salad. Serve while dressing is warm or at room temperature. NOTE: Dressing can be made up to one hour prior to serving. This entry was posted in almonds, Appetizers, Contest, Fruit, Nuts, salad, Sauces, Side Dish, strawberries, Sweet Potatoes, Vegetables and tagged appetizers, Balsamic vinegar, cooking, Fruit and Vegetable, Home, Molasses, North Carolina, Olive oil, Salad, Side dish, Sweet potato, Sweet Potatoes and Yams, Vinaigrette, Vinegar. Bookmark the permalink.